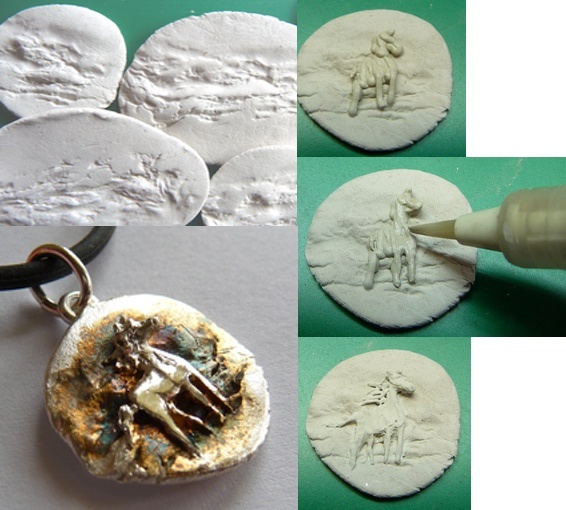 Recent research and the practical work on my silver jewellery have led me from the “White Horses” to the Lascaux Caves in southwestern France, famous for its Paleolithic cave paintings. I always loved horse drawings. When I was very young my grandfather gave me one he had sketched just with a fountain pen, depicting my siblings and me riding- not that we ever owned horses or were allowed to ride one! Typical girl’s dream or not, whenever I was around these fascinating animals I observed them and reportedly there were a lot of horses in my paintings during school age. 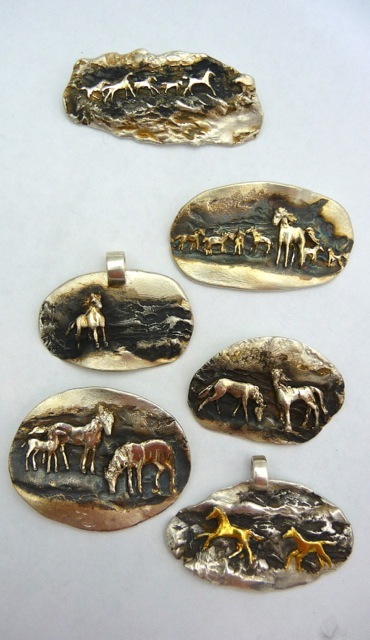 My inspiration for the recent jewellery pieces also came from images of wild horses- we have the “Kaimanawas” here in New Zealand. Below a preview of “Heads & Tales - Wild Kaimanawas” which will be launched during the equestrian show “Horse of the Year” here in Hastings and online beginning of March in my shop “silverworks” at felt.co.nz. I roll out a base piece from the silver clay and imprint the texture for the back. After the decision on where to put one or more horses I start to work directly with the silver from the syringe. A moisture brush is my best friend for the next steps where I paint over the silver and give the horses their shape! When I am happy with the details a bail (the loop at the top) or a pin or finding for the earhook is attached and then the piece is ready to go into the kiln. Patina is then applied on the fired piece. This blackens the silver and gives that wonderful 3D effect. Don’t these horses look as if they could just walk off? This method enables me to create “pictures” and captivate stories and I hope for custom oders for jewellery pieces as gifts with that special personal touch! Wow! Incredibly interesting and what a fab result. so unusual,the silver horse is so wonderful,it is suitable for making a necklace.